Saber Lahman, was arrested under suspicion that he planned to carry out an attack on the USA Embassy in Sarajevo. He was convicted, but was pardoned later after he served two thirds of punishment in prison. He was arrested again in 2002 for participation in al Qaeda's plan for Bosnia and Herzegovina and was sent to the Guantanamo Bay detention camp. On Christmas Eve 2002, Muamer Topalović, a Wahhabist, killed three Bosnian Croat returnees in their home. According DEBKAfile four Kosovar jihadists who planned to blow up iconic Venice bridge arrested. Italian counterterror police forces raided several locations 28.-29.3.2017 and arrested four Islamic radicals who planned to blow up Venice's Rialto Bridge, one of the city's most visited sites, and kill hundreds of tourists. Venice's chief prosecutor also disclosed on 30th Mar. 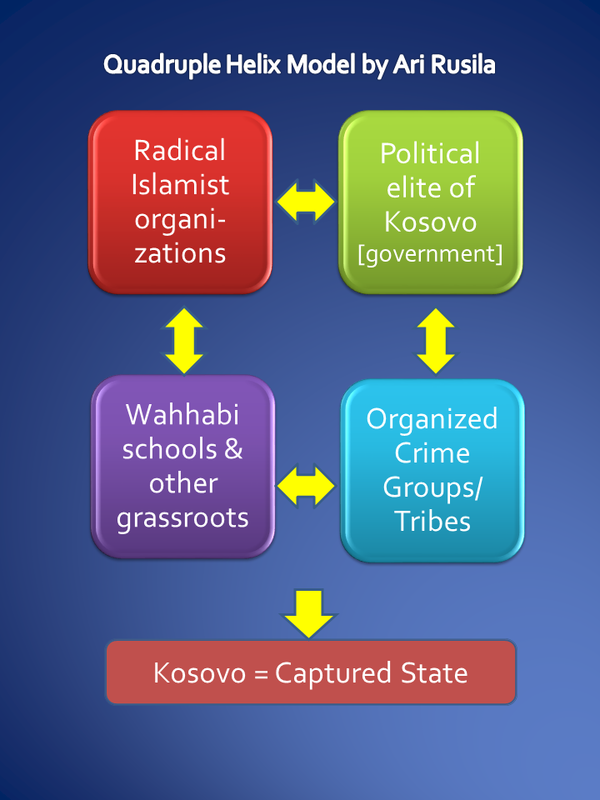 2017 that the authorities had been secretly monitoring the communications of the terror cell members, all citizens of Kosovo linked to ISIS. The radicals were heard expressing joy regarding the March 22 terrorist attack in London, the prosecutor said. Deutsche Welle reports that since 2012, 316 people - including women and children - have left the country to join the so-called "Islamic State" terrorist militia. Of those 316 people, 58 have been killed and 117 have returned to Kosovo, said Baki Kelani, spokesman for Kosovo's ministry of the interior. According to Kelani, 237 people are being investigated for planning and taking part in terrorist attacks outside Kosovo and also for recruiting, supporting and funding terrorists. 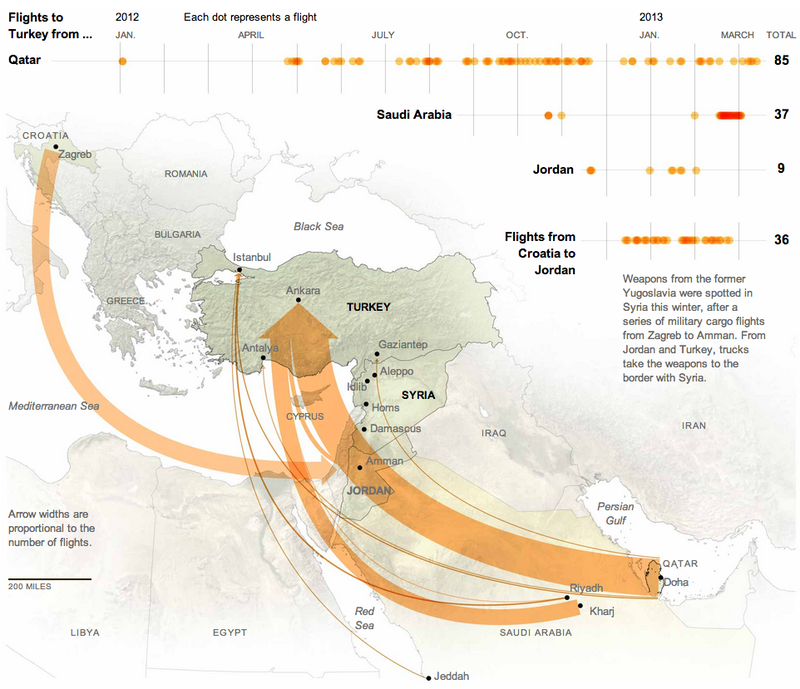 Since 2013, 127 of the suspects have been arrested, including an alleged ringleader. 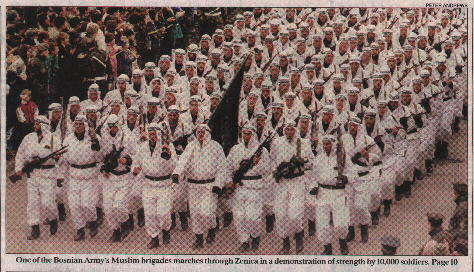 According to figures from security experts, 50,000 Kosovars are now members of conservative Islamic groups. The Telegraph reported that in southern Kosovo the town of Kacanik during 2012-2015 some 24 local menfolk have gone to fight for jihadist groups in Syria and Iraq, giving the town of just 30,000 people an unwanted reputation as the jihadist capital of the Balkans. For a nation of just 1.8 million people, it now punches well above its weight in terms of the number of citizens joining Isil. 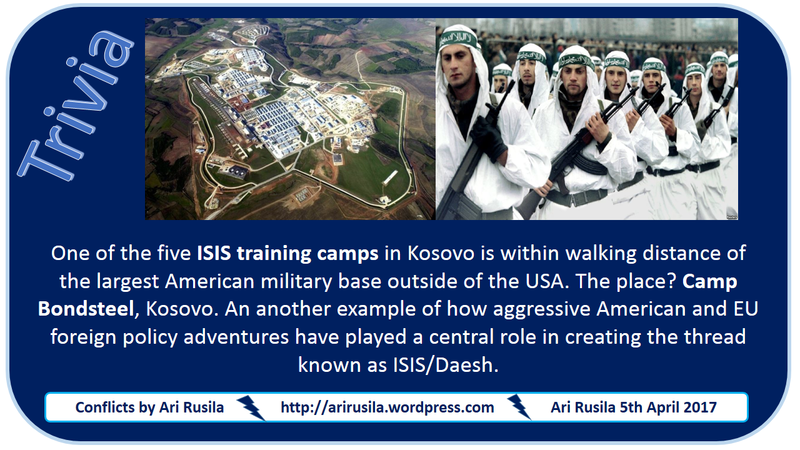 Altogether some 300 Kosovans have joined ISIS, making Kosovo Europe's biggest contributor per capita. 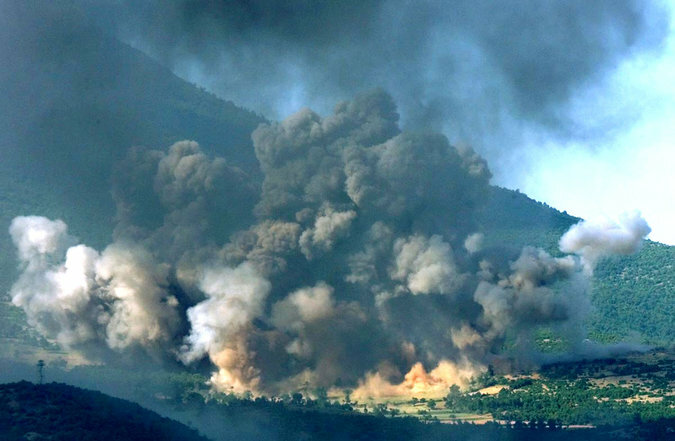 Along with neighbouring Albania, which has fielded around 200, and nearby Bosnia, which around 160, it is now seen as a potential launch pad for ISIS in its bid to establish a new front against Europe in the Balkans. When the US State Department listed the KLA as a terrorist organization in 1998, the reason wasn’t radical Islam but its links to the heroin trade. By 1999, Western intelligence agencies estimated that over $250m of narcotics money had found its way into KLA coffers. 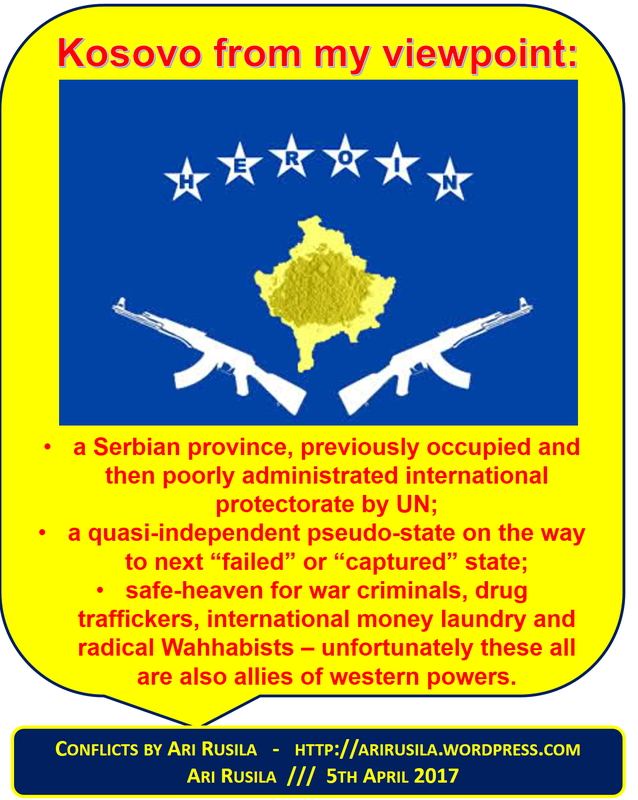 After the NATO bombing of 1999, KLA-linked heroin traffickers again began using Kosovo as a major supply route; in 2000, an estimated 80% of Europe's heroin supply was controlled by Kosovar Albanians. In the summer of 2016, the Kosovar Institute for Policy Research and Development (KIPRED) published a study about the influence of religion on Kosovar identity. According to Lulzim Peci, author of the study, 57 percent of Muslim Albanians feel Albanian and 32 percent defined themselves as Muslims first and then as Albanians. "We see a great shift in identity from ethnicity, the so-called language nation, to a religious-ethnic society," said Peci in an interview with DW. Testimony on the Genesis of Evil - White Book on Albanian terrorism in Kosovo The book addresses the continuity of terrorist activities by Albanian extremists, beginning with the constituting of the parallel system of Albanian government in Kosovo and Metohija and the pretensions of the so-called Government of the Republic of Kosovo headed by Bujar Bukoshi, covering the founding of FARK and the armed forces of "the Republic of Kosovo", which united separation-oriented former officers of the former Yugoslav People's Army, to the founding of the "Kosovo Liberation Army" /KLA/, which at the time of the NATO bombing had more than 20,000 armed members, and the KLA's transformation and engagement of the former terrorists in the Kosovo Protection Corps. What a racist and islamophobic rant. Shame on you. Kiitos kommentista; oliko sisällössä mahdollisesti virheellisyyksiä? Minun ymmärrykseni mukaan ei. Vaan mitäpä minä tiedän, kun olen siellä vain vuoden aikoinaan viettänyt tussari kädessä ja ihmetellyt menoa. Eikä kaikesta ole lupa puhuakaan. Huumeiden runsaus kävi kyllä ilmi, sen voi allekirjoittaa myös jalkaväen perspektiivistä. Toinen pientä länsimaista kulkijaa hämmentävä seikka oli, miten taloudellisesti avuttomissa oloissa muutamilla sattumanvaraisilla sankareilla näytti olevan rahaa hyvinkin reippaasti. Kosovon rahavirroista joissa vienti oli alle 200 miljoonaa, kv avustukset 800 miljoonaa ja diasporalta 2000 miljoonaa vuodessa. Massiivisista tuista huolimatta toissa vuoden pakolaiskriisi alkoi Kosovon albaanien toimesta jotka ehtivät Unkarin rajan yli EU:n autuuteen kuukausia ennen lähi-idän pakolaisvirtaa.